After our visit to The Church of the Holy Sepulchre, we prepared to go to morning worship. 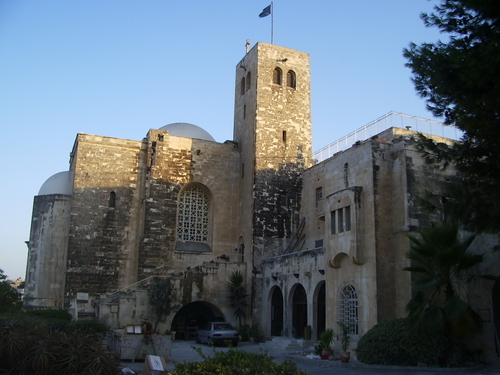 The majority of our group went to St George’s in Jerusalem, the Anglican church where, we were told later, the service was conducted in both English and Arabic (at the same time – I’d like to have experienced that), and everyone came away having felt they were part of a gathered, vibrant, international worshipping community of around 170. Four of us, all Scots, decided to go to St Andrew’s Church of Scotland in Jerusalem. By so doing, we increased the congregation by 50%. The interior of the church is plain in many ways, but also elegant. I thought it a beautiful church. Decorative stained-glass windows in varying shades of what could be called “Church of Scotland blue” dominate otherwise unadorned white stone walls. The chancel area is spacious and each member of the congregation has an individual seat which is named after a Scottish regiment, town or parish whose name is inscribed on the back. Though I wasn’t sure what the “121 George St Club” was. I had waited so long to see and be part of this church as our minster, when I was younger, was a previous minister of St Andrew’s Jerusalem before becoming minister of St Andrew’s Baillieston. My husband had worshiped here in the 90’s and spoke of it as a welcoming church with a real buzz about it. But sadly it was not what I had anticipated. There was no welcome, no feeling of being part of a worshipping community. The people gathered were scattered like the 12 tribes of Israel and no one spoke to us; there were only 12 including the minister, and us. The request for prayer on the order of service made me feel sad “Remember us … Small, forgotten, fragile; faithful, steadfast and courageous. Remember us and pray for us. Amen.” All the elements of worship were present but there was definitely something missing. As we left I was the third of our party and had I not mentioned to the minister that we were visiting and brought greetings from Scotland, we could have come and gone with no-one the wiser. I came away despondent; not because there were so few people, I’ve been in churches before that had low numbers and after all Jesus said “For where two or three are gathered in my name, I am there among them”. No, I came away despondent because nobody engaged with us. I also left hoping this was an off day, because I was only too aware that this is the face of the Church of Scotland, and the Reformed Tradition, in the Holy Land.